I’ve never been a great fan of Warsaw’s main railway station, Warszawa Centralna. It an East European edition of the rabbit hole railway station architectural style, which in Britain produced stations such as the new Birmingham New Street and London’s Euston. After 26 years of planning, the building was put up in a rush between 1972 and 1975. Warsaw’s trams and buses patiently snaked around the enormous building site for three years. A final spurt of activity, and the building was opened with a ceremonial triumph in 1975, just in time for Brehzniev’s visit to Warsaw. For the next 15 years PKP tried the best it could to patch up the worst of the building’s faults. The large booking hall and marbled underground passages were certainly impressive when the station was built. Although nowadays, the rash of kiosks that have sprung up since 1989, rather ruin the effect. Access to the platforms for able bodied passengers has never been easy, access for disabled customers is appalling. When it rains, water finds its way down to the lowest level. The lighting is harsh and unfriendly, yet the overall impression is dark and dingy. However, fundamentally Warsaw’s public transport masterplan is hugely flawed. The city has four key rail services which run into its centre: the WKD which serves an area to the North West of the City, the PKP suburban and stopping rail services, the PKP main line services and the metro. But instead all services coming together in one central station, their stations are strung out like beads on necklace two and a half kilometres long. PKP would like to refurbish the station sometime in 2009, the Warsaw City Councillors – like most most local government in Poland no fans of rail – are thinking of moving the main line terminus out of central Warsaw all together. But the station does have its fans, one blogger writes (in Polish). We have a modern underground station in Warsaw – don’t laugh – if only we gave it a good scrub and drove out the drunks, the building again could be the pride of Warsaw. I was interested to learn that PKP Intercity are opening up the former Government VIP lounge at Warszawa Centralna to certain categories of its first class passengers. Somehow, in the building’s present state, and with the Marriot Hotel just across the road, I can’t see the station becoming a preferred venue for business meetings just yet. As for me, I prefer Stasz Pruszinski’s Radio Cafe, a short walk away in ul. Nowogrodzka, for my serious meetings – great ambiance, good food and amazing customer service. The restaurant is quite small and, although I have never had a problem in finding a seat, please don’t tell anyone else. The place is popular enough as it is! On Wednesday night a hydraulic jack failed under one corner of a new bridge being installed over a busy UK main line – the London, Liverpool Street line to East Anglia – as part of the East London line extension. One corner of the bridge fell 8 inches and some of its concrete decking broke and fell on the railway tracks below. A National Express East Anglia commuter train, the 7.15pm from Liverpool Street to Southend, hit the broken reinforced concrete debris lying on the tracks ahead of his train. The electric traction current was switched off, another train was stopped midway between stations, and thousands of commuters were led out along the tracks to safety. Services were badly disrupted on Wednesday evening and there were no services into Liverpool Street station this (Thursday) morning. Liverpool Street passengers had already faced massive delays earlier this year, when the demolition of an old bridge in the same area during the New Year period, overran by a week. The following plea for help has just been received from South Africa. If ever there was a case for establishing a World Heritage Railway Association, the present danger to South Africa’s railway heritage is surely it. Transnet has — to the dismay of the Heritage Railway Association of South Africa — decided to scrap prized heritage steam locomotives next month. In a letter dated May 15, Transnet gave the heritage association until today to select the locomotives and coaches it wished to keep, either for preservation and restoration or for spare parts. Rail historians said two weeks was not enough time to locate all the historical trains around the country. Shaun Ackerman of Reefsteamers Association, which champions rail tourism and steam locomotive preservation, said Transnet told them the trains were beyond repair and an “eyesore”, and should be scrapped. “The ultimatum they have given us is not reasonable in terms of time and resources,” said Ackerman. Some trains marked for restoration had ended up at the Millsite train depot in Krugersdorp and were being hacked to pieces. Like many other Poles, I came to England to top up my savings. However, unlike the majority of my compatriots, I am also interested in railways and, after three months living and working in Hertford, I decided it was time to return to my hobby. Where to go? 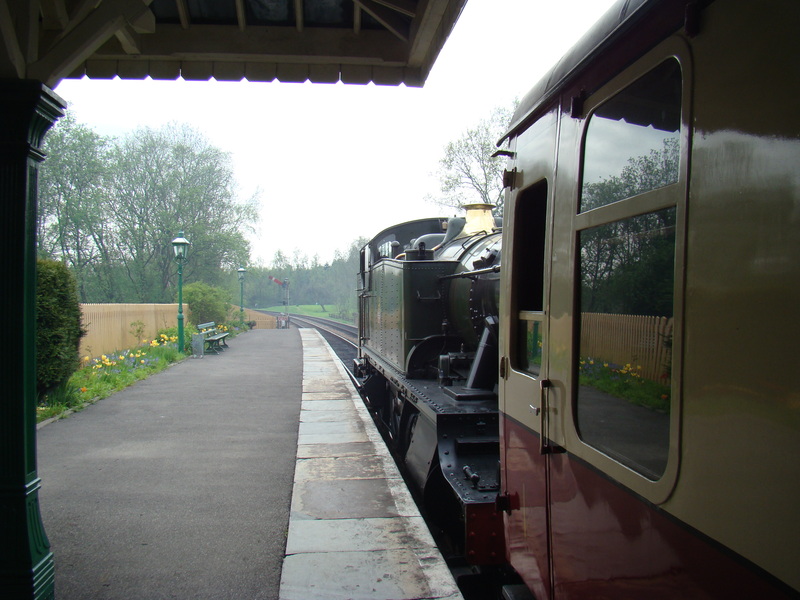 I had heard about the Welsh narrow gauge railways and the ‘Steam’ railway museum in Swindon, but the Bluebell Railway came highly recommended and could easily be accommodated in a day’s outing. So the Bluebell it would have to be. My journey started at 7 am on 4 May, outside Hertford North Railway Station. My morning ‘train’ was a bus provided by First Capital Connect. Apparently up to 8.30 a.m. all the morning trains are substituted by buses as an economy measure. One and a half hours later I’m at Alexander Palace. The train would have done the journey in one third of the time. Here a real train takes me into Kings Cross. Soon I am walking on a platform steeped in the history of the LNER. I think of the exploits of Mallard and the Flying Scotsman. I walk across the road and find myself under the glass roof of St Pancras Station. The restored station is breathtaking and I’m sure that British people must be very proud to have such a gateway to the outside world. I take an escalator to the Victoria line platform. Every time I travel on the London Underground, I am conscious of the enormous amount of work that must have gone into its construction. I am also impressed by the efficiency of the whole enterprise. Victoria Station seems enormous. The 19 platforms make quite an impression. I have 20 minutes before the departure of my train to explore the station. I notice the third rail electrification and wonder about the lack of standardisation on Britain’s electric railways. The hour-long journey to East Grinstead is interesting. There are numerous junctions along the route and the hilly landscape beyond London necessitates a couple of tunnels. East Grinstead, once an important railway junction, is now a terminus. Sadly, as in the case of many British railway stations, the time of its zenith has long passed. A few hundred metres separate the end of the railway from the start of the Bluebell Railway’s tracks. Unfortunately, to reach the first station on the Bluebell Railway I will have to go by bus. There doesn’t seem to be any coordination between the train timetable and the bus timetable and I waste an hour walking around East Grinstead. 11.10 a.m. approaches, and so does my bus. There are not many passengers on board, but from their conversations I deduce that most of them, like me, are on it in order to visit the Bluebell. We climb and descend some sharp gradients, dive under a railway viaduct and turn into Kingscote Station. The small station has a red-brick building, green cast iron lamp standards, and is very attractive. Inside, it is as if time has stood still. The fire in the fireplace looks ready to light, the walls are covered in old posters, every inch of wall is correct in period detail. Outside, the impression of having travelled back in time, is reinforced. Two old goods wagons stand in a siding, there is a traditional signal box and all the staff are dressed in the correct period uniforms. On the Bluebell Railway – the Beatles are yet to sing, man has not yet landed on the Moon, and most importantly of all, no trains are hauled by diesels – it is still the 1950s. Do you enjoy flying? I find the whole business of flying between the UK and Poland incredibly wearying. Already at check in, a hint of existential doubt creeps in. Is my floppy bag containing all my belongings going to be passed as ‘hand luggage’? “Do you have any sharp objects in your hand luggage?” Gulp! Does my safety razor count? “Could anyone have packed anything in your luggage?” Well, I did leave my baggage unattended to go to the loo, and I’ve always had my suspicions about my flatmate since he admitted reading Postman Patel’s blog. Having survived check in, the next step is security control. I present my transparent bag containing my Sensodyne toothpaste. Are people who have neglected their teeth seen as a greater security risk? Off come my shoes, belt, jacket… “No, Sir it won’t be necessary for Sir to remove his trousers.” But there’s a metal rivet in my jeans, won’t it set off the alarm? At last, like the seasoned traveller that I am, I pass through without being challenged. I collect my mobile, wallet, dirty paper handkerchiefs from the plastic tray thoughtfully provided and march through to the “duty free”. Well, its duty free no longer, but the airport supposedly pays the tax. All the food here is incredibly expensive. It’s over an hour and a half to the departure of my flight. I buy a small bottle of water for £1-25. That’s 5 zloty! I get myself a book and sit down within eyeshot of a monitor. But I can’t relax. There are large signs informing me that all gates are at least 12 minutes walk away. If that’s 12 minutes for people who regularly jog, how much longer will it take for people who regularly blog? But before, I can enjoy my own joke an announcement comes over the tannoy. “Check in for flight 2269 to Barcelona is now closing!” So if anyone is still in the main departures hall, unless they are an Olympic runner, by the time they get to their gate it will be closed. Better proceed to my gate then. It is a long and surprisingly tiring walk. Have you noticed how most airport walkways smell of rats? This one is no exception. It seems that 150 fellow travellers have also come to the conclusion that it’s safer to proceed to the gateway than to wait in the main departure hall to be called. I sit near an adjacent gate in an area which is reasonably empty. At least I am only 2 minutes away from my target rather than 15. I drink my water and contemplate going to the loo. What I really need for my flight is a bottle of beer on board the plane, but that’s apparently the favourite weapon of terrorists so, unless I invest 15 euro on the plane, I have to drink my beer now. I buy a bottle of beer for £3-00 and return to my calculations as to when would the be best time to go to the loo. My reverie is broken as a large lady complete with larger daughter and frail mother decides to sit at my table. Our departure time comes and goes, but nothing happens. I make regular little forays to my gate to check that the plane has not flown without me. But there’s no plane and no information. An hour passes, then another half an hour. At last there is an announcement. Passengers who have bought priority boarding and passengers with small children will board first. I’m happy to keep out of the scrum and be one of the last to board. I comment in Polish on the quality of the airline’s customer care to one of the passengers who has a similar boarding philosophy to my own. He answers in perfect Polish, but there is just a touch of accent. Within the next 5 minutes I inform him that he was born in England, brought up in Ealing Broadway, attended Polish school and was awarded a Polish passport because of his father’s military service during WW II. He is duly impressed and we are destined to chat away merrily during the flight. The steward barks the safety announcement at the passengers. “You will all be quiet!” he orders. He clearly loathes everyone of us. Is he working for Ryanair or someone else? We wait on the tarmac for an inordinately long period of time. What is happening? Have they rerun the film of my hand luggage and found my safety razor? Are the engines being repaired? If anyone knows they’re not telling. At last the engines are revved and we taxi to the main runway. I remind myself that take-off and landing are the most dangerous parts of a flight. I say a silent prayer and agonizingly slowly the plane begins to lift off the ground. I immerse myself in my book, emerging occasionally to answer my companion’s questions. The two hours pass quite quickly, the seat belt signs are turned on and the plane looses hight rapidly. The landscape become suburban then urban. We zip above the roofs of a block of flats and narrowly miss the chimney of a combined power station and district heating plant. The pilot has missed the airport! Is he going to crash the plane into the new shopping centre? The plane executes a sharp-banked jet-fighter turn. Are we going fast enough? Will we stall? We fly back towards Britain for 5 minutes, make a more leisurely turn, and this time manage to hit the runway. Another long walk, an unsmiling welcome from a lady at Polish border control and I’m back in Poland. I’m tired, dirty and stressed out. Why did I go by plane? Because it was only £20. Would I have gone by train if a ticket was available for the same price? You betcha! The 760 mm gauge Szechenyi Hill Children’s Railway in Budapest is 60 years old this year and is organising a number of events to mark the anniversary from 17 May until 3 August 2008. On June 7, former and current operators of the railway will serve duty together. On June 23, the Night of Museums, the railway will stay open until midnight. Between July 31 and August 3, a train made up of vintage rolling stock will be in operation every day. The Children’s Railway was built between 1948 and 1950 connecting Huvosvolgy (Cool Valley) and Szechenyi Hill. At that time, and indeed until 1990, it bore the name Pioneers’ Railway. The Pioneers was the only children’s organisation permitted in the Communist era. Although the railway is often called ‘the greatest childeren’s toy of the world, the youngsters don’t get to drive the trains. Apart from that, children operate the switches and signals, print tickets and keep passengers informed. They are supervised by adults and the line is operated according to regulations of the State Railways of Hungary (MAV Rt). Railways are conservative and the Children’s Railway is no exception. The regulations relating to fares are as still complex and unintelligible as they were in Soviet times. The following extract gives a flavour. The holder of the valid Budapest Card and his companion aged between six and fourteen can travel along the entire line of the Children’s Railway using section tickets instead of line tickets. The holder of the card is eligible to an adult section ticket, his companion to a children’s section ticket. The Children’s Railway is a point of acceptance of Budapest Cards but they cannot be bought there. The journey must be completed on the day of issue. The journey must be started at the station where the ticket was issued. Return tickets are valid to the terminal station on the returning leg of the journey. The journey cannot be suspended and continued using the same ticket. Family daily tickets excepted. Other types of tickets lose their validity upon the suspension of the journey. Therefore a new ticket must be bought in case of travelling on. Still, its ticket regulations notwithstanding, the Children’s Railway has survived the transformation of The Hungarian economy and has become a major tourist attraction in its own right. We recommend paying a visit. My old friend Mike, who occasionally posts on rail topics on Wwa Jeziorki, takes PKP to task for its Cracow – Zakopane service, ‘147 km in 3 hrs 45 min’. His post leaves me in something of a dilemma. I could adopt a contrarywise position and defend PKP, pointing out that that: most fast trains take about 3 hrs 30 min to do the 150 km journey; the fastest journey of the day (by a slow osobowy service) takes only 3 hrs 15 min; 10 minutes is a reasonable time for a driver to stop at a station, uncouple all his connections between his engine and the train, run round his train, recouple the engine to the train, check the braking system, establish that it’s safe to do so and then start off again; a thirty minute wait at Plaszow (a combination of 20 minutes recovery time for the train coming in from the Ukraine plus 10 minutes additional waiting that day to hold the connection) is quite reasonable; and that if he was in such a flaming hurry why didn’t he hop out at Plaszow and take the next train to Krakow Glowny? But to do so, so my conscience tells me, would be skipping over everything that is wrong with PKP. And there is much that needs to be put right. Should I then agree with Michael, adding for good measure that PKP management culture is Neanderthal and that the customer feedback mechanism dates back from when the Polish railways were an extension of the Soviet military control system that held half of Europe in its grip – freight trains had priority and long distance passenger trains travelled at night. But either approach would be nerdish and miss the whole point of traveling by train. Travelling by train across Poland is an experience to be savoured. Like a good wine or a good woman, Polish trains are not to be hurried. Polish express trains have compartments which once upon a time all proper trains used to have. The PKP Intercity restaurant cars have helpful attendants who make smashing scrambled eggs and always have some illicit bottles of beer or ‘something stronger’ for their special customers. Guards will, if there not to busy, happily talk to you and pour out their hearts on what is wrong with the Polish railway system. So, if you want to relax, forget any question of ‘How long does it take?’ Take a good book, be prepared to talk to learn about Poland from some interesting companions, and enjoy the Polish countryside rolling past your window. On the other hand if you like being stressed, you could do your long distance travel across Poland by bus or car, but I wouldn’t recommend it. Zakopane to Krakow. By road or by rail? By road, traffic jams. The road between the two, the Zakopianka, where 100 km can take 10 hours on a Sunday evening, is one alternative. The other is the railway. The romantic in me quite fancies a picturesque railway journey. Surely the train must be the better bet? As it happens – no. The train winds its way, without undue hurry, taking three hours and 45 minutes to cover 147 km. Average speed less than 25 mph. Three times along the way (at Chabowka, Sucha Beskidska and Krakow Plaszow), the engine uncouples from the front of the train, attaches to the rear of the train, and proceeds out of the station the same way it came in. The train leaves Zakopane at 12:00 and arrives, on schedule, at Krakow Glowny, at 15:45. At least it was cheap – the ticket cost me 13 zlotys (three quid). Five zlotys less than the bus, which, on the way out on Friday lunchtime cost 18 zlotys (just over four quid) and took two and half hours. State railway PKP is its own worse enemy. It does not know how to communicate with passengers and potential passengers. Everyone knows the bus is better, even though the Zakopianka is one of Poland’s most notorious roads. The train was running nearly empty – I had an eight-seat carriage to myself all the way. Why isn’t the service scheduled better? 10 minute wait at Chabówka to put the engine at the other end, a similar wait at Sucha Beskidska – then half an hour (!) at Krakow Płaszow to attach the train to another, coming from Przemysl… and Kiev (!!). The journey would have been better had someone told me to jump off the train at Krakow Lagiewniki station, 10km/6miles from Krakow Glowny, and taken a taxi or public transport. The last 10km took 50 minutes (!!!). Much of PKP will disappear because of the uselessness of its management. Here’s a transport problem (getting tens of thousands of people out of Zakopane, through Krakow and onto the outside world) waiting to be solved. And PKP management is asleep at the wheel. Original post on W-wa Jeziorki blog. Another Colonel Stephens Railway secure! Shepherdswell as opened, today’s track layout (click pic) is virtually identical, though laid with heavier section bullhead rail than the original flat bottomed rail employed by Col. Stephens. The Col. Stephens railways, such as: the East Kent, Kent and East Sussex, Rother Valley, Festiniog and Welsh Highland, Snailbeach, Rye and Camber, and Ashover (click for complete list) had a Emett-like charm all of their own. Most have succumbed to ‘progress’ although – the Kent and East Sussex and Festiniog were taken over by preservationists, the Welsh Highland is being completely rebuilt from scratch, the Rother Valley is acquiring land and laying track, the Snailbeach revival was until recently making cautious progress and the East Kent survives in part as a diesel-operated heritage railway. Until its closure in the mid-1980s, the East Kent Railway linked Tilmanstone colliery to the main line at Shepherdswell. A preservation scheme was initiated by the former East Kent Railway Society and in 1993 the Society obtained a Light Railway Order. This authorised the British Railways Board to lease or sell the railway to the Society and to transfer to the Society its statutory powers to maintain and operate the railway. However, following the privatisation of British Railways the Society were told that BRB (Residuary) Limited, successors to the British Railways Board, would not be prepared to sell the freehold to an unincorporated body. The East Kent Railway Trust (EKRT) was set up as the successor to the Society, but then needed to apply for an Order under the Transport and Works Act 1992 to authorise the transfer of the railway to EKRT as such an eventuality was not provided for in the 1993 Light Railway Order. In spite of a number of objections received from local residents, on 10 October 2007 the Secretary of State announced her decision to grant the order. An important consideration was the submission in favour of the order submitted by David Morgan, Chairman of the Heritage Railway Association. On the 23 April the EKRT was able to announce the purchase of the freehold of its two-mile trackbed from Shepherdswell to Wigmore Lane as well a 16-acre woodland and meadow plot at Shepherdswell, the site of the line’s original locomotive and carriage workshops. The railway wants to rebuild the workshops on the site while preserving the woodland, which is designated as being of nature conservation interest. The £42,000 needed to buy the land at Shepherdwell was raised within an 8 week deadline. On 24 May, Fundacja Era Parowozow (Steam Age Foundation) is offering a late afternoon free train ride from Grodzisk Wielkopolski to Wolsztyn Station. There’s no catch, but a voluntary donation towards the cosmetic restoration of Ty43-123 would be appreciated. Details on the Foundation’s website. ‘Snow’ is probably the best corporate film ever made. It was Geoffrey Jones’ first film for British Transport Films. In September 1962, Jones began his research for a film about design for the British Railways Board. Armed with a 16mm camera, he travelled throughout the country, shooting film of anything he found particularly interesting. Viewing the footage, he hit upon the idea of making a second film contrasting the comfort of the passengers with the efforts of the railwaymen to keep the railway tracks open for traffic. On January 31st 1963, Jones met with BTF head Edgar Anstey. Realising that the film would have to be made quickly or delayed until the following winter, Anstey agreed straightaway and shooting commenced the very next day. Jones and his crew chased winter conditions across the country. Though the footage we see is mostly the Western Region. There is also a tantalising glimpse of a Somerset and Dorset freight train as well as some archive pre-WW II shots of Jubilee class locomotive ‘Barbados’. The powerful musical accompaniment is ‘Teen Beat’ by American Jazz musician Sandy Nelson re-recorded British musician Johnny Hawksworth with special effects by the BBC Radiophonic Workshop. ‘Snow’ received at least 14 major awards upon its release, as well an Oscar nomination in 1965. The film marks the first coming of age of Jones’ style, which was further developed in subsequent films such as ‘Rail’ (1966), ‘Trinidad and Tobago’ (1964) and ‘Locomotion’ (1975). This is British Railways at its best: a 30,000 mile railway network, loads of goods trains and STEAM! Make yourself a mug of hot chocolate, turn the volume on full blast, click on the picture and retire a safe distance from the screen. At the beginning of May, the Hungarian Railway Museum’s Mav Nosztalgia vintage train visited the Wolsztyn Steam Gala, as part of a five-day tour. The train is based in the former Budapest North Depot which has a 1911 roundhouse with 34 bays, an ideal home for the museum’s operational vintage fleet. This includes a steam engine built in 1870 and a 1934 railcar, which in its prime sped from Budapest to Vienna in just under three hours. The gem of the vintage fleet is an elegant teak dining car built for the Orient Express in 1912. Altogether there are fifty locomotives in its care, twelve operational and the remaining thirty-eight cosmetically restored. 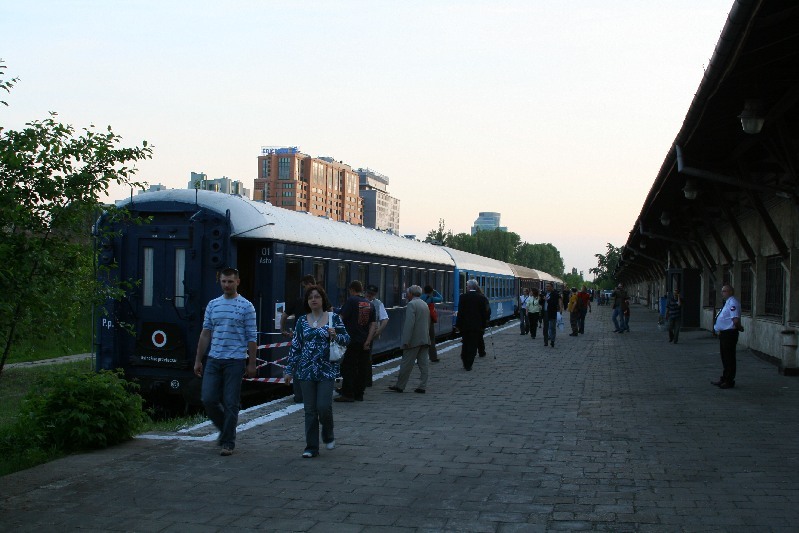 In addition the museum has a large range of vintage rolling stock: railcars, self-powered rail cars and hand-carts, inspection cars, steam cranes, snow ploughs and other curiosities.o All together there are over a hundred railway vehicles and equipment of varying ages on a site of over 70,000 m2. The creation of the Hungarian Railway Museum was a joint venture by the Ministry of Transport and Waterways, MAV (Hungarian Railways) and MAV Nosztalgia Ltd, the heritage division of MAV. The museum opened on 14 July 2000. It is marketed as Europe’s ‘first interactive railway museum’. Not only can visitors admire the old machines, they can also try them out. They can drive a steam engine, travel in a car converted for rails, operate a hand-cart, ride on the turntable and on the horse tram. The engine simulator offers a virtual experience of driving the most powerful Hungarian electric railway engine, using the original equipment, while the rail-cycle challenges one’s sense of balance. There is also a model railway that visitors can admire and even operate. 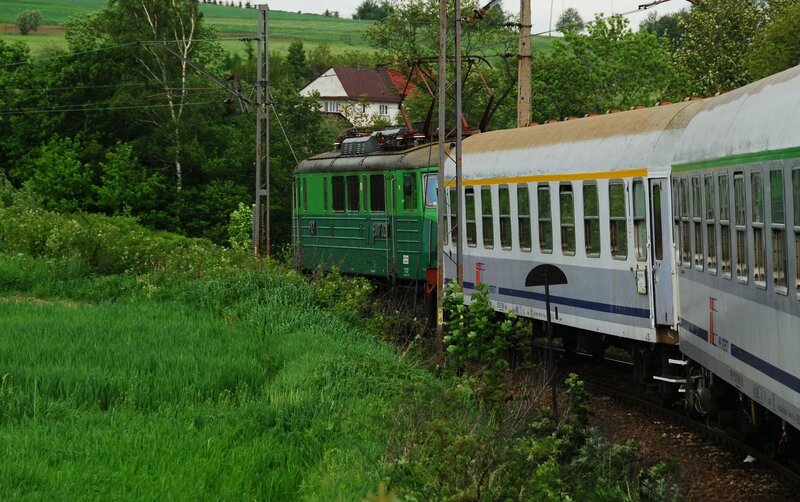 From 1 April to 31 October, a vintage diesel shuttle train runs between Budapest’s Nyugati Station and the museum. Nice to see someone trying to persuade people to use public transport. Reminds me of those heady days when British Rail used to advertise. Now the UK Government as part of its sustainable travel policy (?) has decided that its ‘modally agnostic‘ and has made UK rail travel the most expensive in Europe. The mystery of the Government train’s visit to Warsaw is solved. Yesterday was the Long Night of the Museums, Noc Muzeow. The Warsaw Suburban Railway, WKD, in association with their enthusiasts society, Klub Milosnikow EKD/WKD, needed somewhere to hold a big party. So as the day drew to a close the Government train was moved from its temporary sojourn at the Railway Museum site at Warszawa Glowna to the WKD terminal station Warszawa Srodmiescie. The Warsaw trams, whose 100th anniversary of electric traction was on 5 April also joined in the celebrations. So, just out of curiousity, how did the Warsaw Railway Museum celebrate the Long Night of Museums? Answers, as always to our usual address. A railway water tower, but where? Well, well, nobody is taking away the bottle of Zubrowka just yet, it seems that none of our readers know what the Polish government train was doing today in a siding in the centre of Warsaw. (Confused? See previous post.) However, here at BTWT we are generous folk and the bottle of Zubrowka remains on our editor’s desk unopened and can still be won. All you have to do is answer our 4 questions correctly. Today we post question number 3. Where is this water tower? For an extra point (so you could still get that bottle even if you got one of the other questions wrong) which of our previous posts could this illustrate and what should the caption be? First a model railway journey from Stuttgart to Northallerton, by fellow wordpress blogger korchstall. Korchstall normally blogs about his tiny model railway based on industrial narrow gauge practice, but this time, it was the journey itself that was a ‘model’ of fast, comfortable and stress free travel. 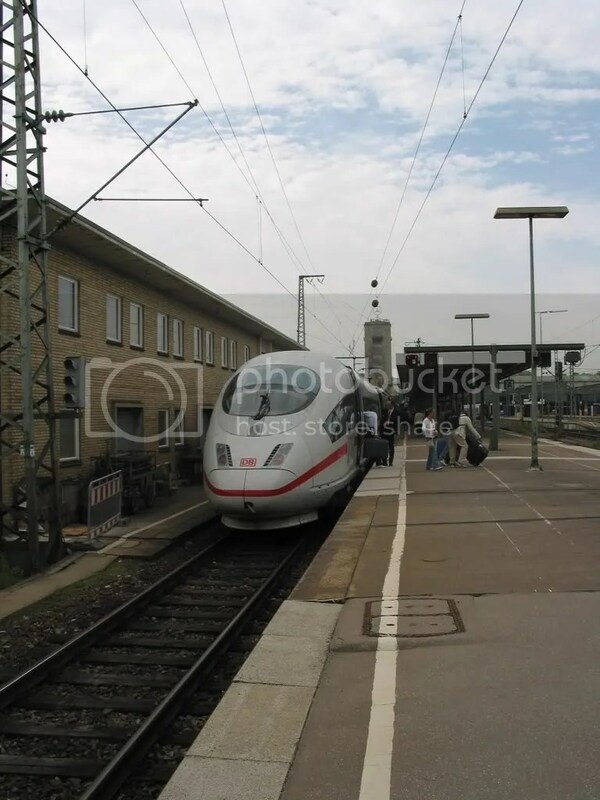 Well, it turns out that travelling across Europe by train was easier than we dared hope. The bus, tram and trains generally behaved themselves and worked reasonably to schedule, the station staff were friendly, we could carry food and water, go for walks along the train and see the view (except in the tunnel). it was far, far better than flying. The only slightly stressful part of the journey was the change from the Cologne-Brussels train to the Eurostar. Normally the procedure for changing train was pretty simple: get off train, follow signs to platform, find the approximate place for our coach and wait until the train pulled in. Eurostar insists on shoving its passengers through all manner of checks, and on top of this the British Immigration service checks our passport here, it seems a bit odd to be checking passports for the UK when we have to cross the border to France first, but there we go. To be fair to National Express, the train left on time, and two hours and twenty minutes later we were in Northallerton. We’d travelled half way across Europe and arrived within two minutes of the planned time- earlier, as it happens. Try that in a car. 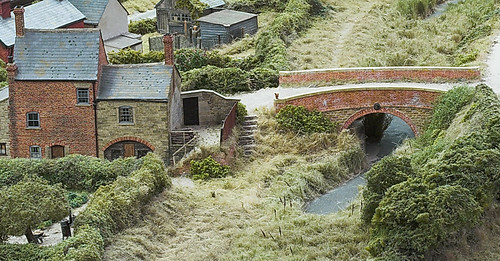 Secondly, at this year’s RAILEX 2008 Model Railway Exhibition, you’ll have the chance to see 25 model railway layouts, including the Manchester Model Railway Society’s award winning ‘Dewsbury Midland’. The exhibition is being held on Saturday 24 May (10:30am – 5:30pm) and Sunday 25 May (10am – 5pm) at the Stoke Mandeville Stadium, Harvey Road, Aylesbury, Buckinghamshire, HP21 9PP, England. Thirdly, a model derelict canal (based on the Wilts and Berks) on arguably the most amazing model railway in the world at Pendon Museum. Oh you want to see pictures of model trains? Just keep on clicking through the links! 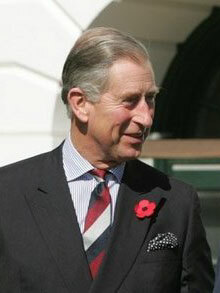 Dyspozytor has been a fan of Prince Charles ever since he had the opportunity to meet HRH on the occasion of the Prince’s visit to the Blackbird Leys Estate in the early 1990s. We applaud the Prince’s courage in ‘joining up the dots’ in a way that the UK government has singularly failed to do. Not all that long ago as part of its overseas aid programme the UK government was actually financing the building of a new road through the Amazonian rain forest. The rate of deforestation is directly proportional to the building of new access roads. We hope that other prominent figures will support the Prince’s call. Now how about somebody equally prominent calling for the Government to abandon its airport expansion programme in favour of the construction of a UK-wide high speed rail network? When the Somerset and Dorset Railway closed in 1966 as part of the plan to give Britain ‘a sensible little railway‘, few would have believed that 42 years later there would still be a sustained campaign to reopen the line. One of the original campaigners was a formidable Shillingstone resident, called Ruth Colyer, who as well as campaigning for the future of the S&D, gave generous support to the fledgling Swanage Railway Society which was set up in 1972 to reopen the the branchline from Wareham to Swanage. This is not a post about the Swanage Railway, but about the campaign to reopen the Somerset and Dorset Railway. But when has being “off topic” ever stopped the Dyspozytor from telling a good story? Ruth was the local secretary of the Ramblers Association and a doughty fighter in the cause of maintaining local rights of way. Her opponents were wealthy and well-connected landowners who saw the public’s use of footpaths and bridle paths as an unnecessary nuisance. She believed that ‘action speaks louder than words’ and when British Railways responded to the Swanage Railway Society’s plans by commencing track lifting from Swanage to Furzebrook she organised a sit-in on the railway formation. It was thanks to Ruth that Dyspozytor learnt some of his own campaigning skills, was tagged as a possible ‘threat to parliamentary democracy’ by MI5 and had his telephone tapped. (Those BTWT readers wondering why Dyspozytor prefers to post under an alias now have their answer!) Ruth’s activities were something of an embarrassment to her brother, Norman Reddaway, who at the time was Britain’s youngest ambassador, and was serving in Warsaw! It is to Ruth Colyer’s memory that Dyspozytor dedicates today’s post. One of the leaders of the current campaign is Steve Sainsbury, the former finance director of the Somerset and Dorset Railway Heritage Trust, who runs his own blog, somerset and dorset. He introduces his campaign with a warning that the project may take several generations to realise. The New Somerset and Dorset Railway will be a huge project, occupying generations to come. All with an interest in the S&D – past, present and future – are welcome to get involved in any way they can. With Peak Oil and Climate Change now firmly upon us the Second Railway Age is just beginning. The New S&D will be in the vanguard of these exiting and challenging developments. The Government is committed to the growth and development of the railway. This is reflected in the White Paper Towards a Sustainable Railway (Cm 7176) which was published in July 2007 and commits to £15 billion in total Government support to the railway for the period from 2009 to 2014. The Government’s priority over this period is to increase rail capacity. This is necessary to allow the network to cater for the steady growth which has seen the number of passenger journeys exceed a billion in each of the last three years. With this in mind, £10 billion out of the £15 billion promised in the White Paper will be devoted to measures designed to increase capacity. The White Paper commits to a range of specific capacity-increasing measures including 1300 new carriages to be used on the most congested lines in the country and major improvements at a number of individual stations. It does not commit to any line reopening because these are not the most effective way of securing the early capacity increases that are the most pressing need for both passengers and freight operators. This does not mean that the Government is against the principle of rail reopening. Where local and regional authorities are prepared to take the lead in drawing up a proper business case for reopening a particular line or stations and identifying funding, the Government will carefully consider the case. This applies to the Somerset and Dorset as it does to any other line proposed for reopening. Having reduced railway capacity systematically since the 1960s in order to reduce costs we are now told the government priority is to increase the capacity of the railways, not reopen closed lines. Perhaps next time the Ministry for Transport plans a new road we should argue that its priority should be to increase capacity not build new roads? Meanwhile volunteers are working on acquiring and restoring various sections of the old S&D. One group has made a start in restoration work Shillingstone Station which is where today’s post originally began! A year, one month and 12 days ago the French broke the world speed record for a conventional (steel wheel on steel rail) passenger train. Now which country was it that first introduced railways as a modern form of transport?